Heads or tails? Toss like a professional referee with this AXIWI toss coin! The AXIWI toss coin has the text ‘Heads’ on one side and on the other side ‘Tails’. The coin is also printed on both sides; with a whistle (image) on the bottom and at the top of the coin the logo of AXIWI. The text and our slogan is printed in the side of the coin: “Best Performing Sports Communication”. 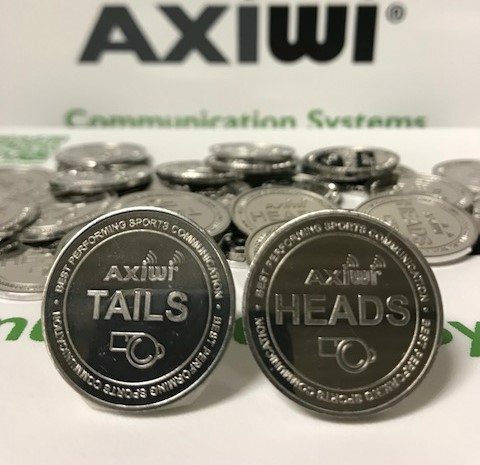 The AXIWI toss coin is very popular and we want to make it easily accessible for referees. In exchange for an original / speaking / creative post on your personal Instagram and Facebook with the AXIWI communication system or with the AXIWI toss coin, we can provide you the coin for free. If you want to buy the coins from abroad (outside the Netherlands) we ask you to pay, in advance, with Paypal. We will charge 3% costs (for paying with PayPal), on the selling price of € 2,50 (excl. VAT). Send an e-mail to info@AXIWI.com with the request for an AXIWI toss coin. In case you are not yet a customer, send the following information, additional to your request, in the e-mail: Name, Address, City, Telephone number, e-mail address and your social media accounts. After receiving the e-mail we will send the coin to the given address. Share a picture with text on your Instagram / Facebook / Twitter account no later then one week after receiving the coin. Or a picture of yourself with the coin; all the way to (on the sports field) for example. The photo then provides you with a catchy English text and with at least the following hashtags: #AXIWI #coinflip #referee #umpire. As long as we have the coins, the action applies.